A healthier version of an Italian favorite. Similar flavors but skipping a few fattening steps-mainly breading and frying the chicken. One way to wake up the flavors of prepackaged foods is to doctor it up with fresh ingredients. Pop this in the slow cooker, go about your day and forget about it until dinner time. Place all ingredients into a gallon sized freezer bag, store in freezer until the morning you are going to prepare it. Spray Crock-Pot generously with nonstick cooking spray. Shred chicken with a fork, serve over pasta. Add a simple side salad and bread to make this meal complete. I was drawn to this recipe because of the picture…thought it looked great and delicious…plus easy. It is important for me to prepare dishes that are delicious and look appetizing to eat for company or family. However, I am very disappointed that the picture has nothing to do with the recipe and would not turn out anything like it looks….not fair. Thank you for the inspiration as I will write my own recipe and trash this one! I do love chicken parm and made in a slow cooker! oh yes, that makes this a double win! This is such a great recipe! Thank you so much for linking it up with mouthwatering mondays! Looks yummy, I love easy crockpot recipes. My crockpot chicken usually comes out looking a lot like the picture after I shred it and it’s delicious! Thanks for sharing, I’ll be adding this to my meal plan next week. 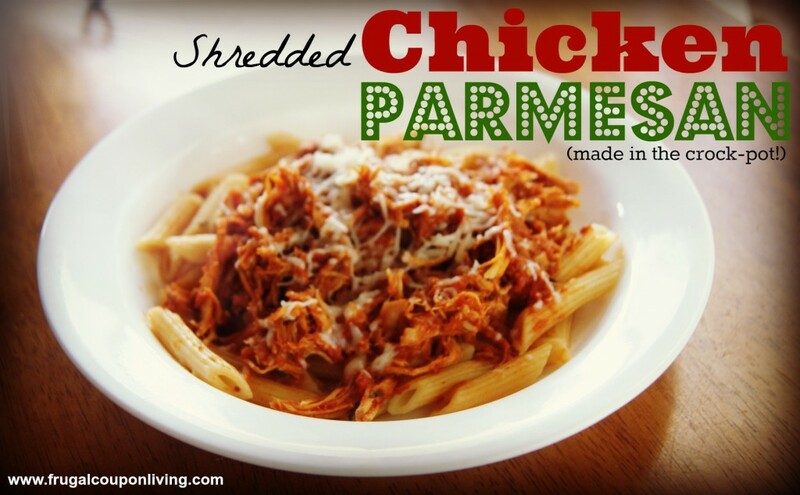 Your Crock Pot Chicken Parmesan looks delicious! Hope you are having a great day and thank you so much for sharing with Full Plate Thursday! This would be so perfect for busy days. Thanks for linking up with What’s Cookin’ Wednesday!